Hello, volunteers! We couldn’t serve over 7,000 students in SFUSD each year without you. Here you’ll find resources to help you find your way on your exciting adventure as an 826 volunteer. Registered volunteers, sign up for shifts here! We offer several trainings a semester to keep your skills ship-shape. This amazing crew will inspire you to get involved and get to know each other. You can sign up for shifts that fit your schedule, and there’s no minimum time commitment. That said, our programs (and our students!) benefit from your consistency—it’s a great way to see the same students grow over time, to form a bond with your fellow volunteers, and to help us meet students’ needs. So we ask that when possible, you sign up for a regular shift. Do I need to be an expert writer or tutor to volunteer? No! Volunteers are not required to be an expert writer, editor, or published author. However, it is crucial that volunteers are excited and eager to do the important work of supporting our young learners with a positive, flexible approach. We ask that volunteers come with an open mind when learning 826’s tutoring best practices, values, and when working with our students. We provide a lot of training in the orientation and ongoing training opportunities along the way! I signed up for my first shift! What can I expect? Great job! The 826 staff member who leads the program will send you an email shortly before your shift with all the information you need. When you arrive, let the staff or other volunteers know that it’s your first time—everyone will be ready to welcome and orient you! There are so many volunteer opportunities. How do I know which one is best for me? We recommend trying a few different programs to see what age group, type of tutoring, and program suits you the best. You can view the volunteer calendar by location, and sort it by program within that location. And if you’d like some consultation, you can always reach out to volunteer@826valencia.org with questions. I’m just a big fan of 826 Valencia. How else can I support you? We’re big fans of you, too. We’re big fans of you, too. You could recruit a friend (or five or eight-hundred-and-twenty-six) to volunteer along with you, or make a donation! 95% of our funding comes from individual gifts of all sizes. We offer tutoring after school to assist students with their homework and writing projects. 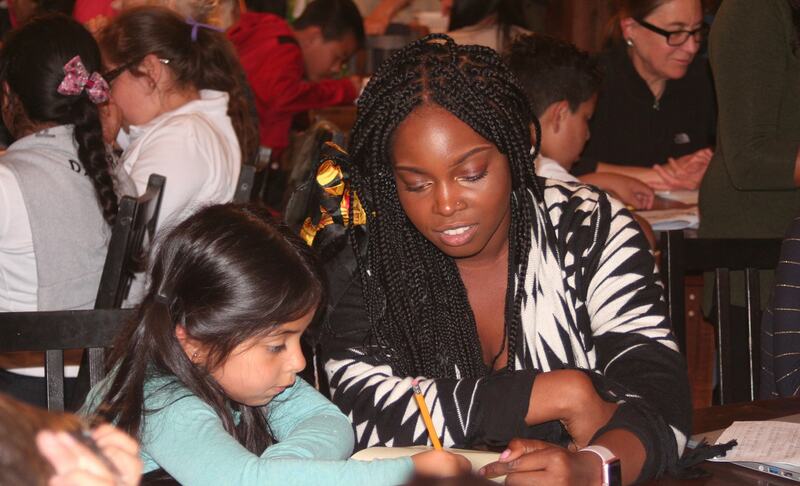 We send tutors into schools to support teachers with their classroom writing projects. Our eclectic mix of evening and weekend workshops are designed to sharpen writing skills and foster creativity. 826 provides programming year-round, with special summer offerings.